Pflow hydraulic lifts provide reliable and economical vertical lifting for mezzanines, balconies, and other two-level applications. Pflow hydraulic lifts offer heavy-duty construction and advanced safety technology with proven reliability. Our hydraulic lifts are available in straddle or cantilever design. Series 21 Lift Provides Efficient, Safe Vertical Handling for Loads Up To 6,000 Lbs. 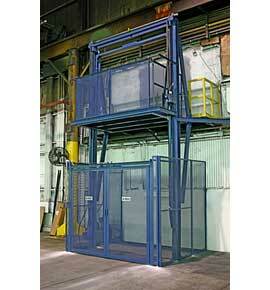 Adaptable for mezzanines, through-floor, inside or outside applications. Customized to meet your exact needs. Quality construction with 6" wide flange columns, oversized bearings and heavy roller chain ensures strength, durability and long-lasting performance. Lifts loads up to 6,000 lbs. Carriage sizes to 10' x 10'. Vertical rise heights to 22'. Available in straddle or cantilever styles. Torsion bar links the two hydraulic cylinders to equalize the load and ensure the carriage remains level at all times. Available with patented DeckLock system that automatically locks carriage at critical upper levels and eliminates carriage bounce or drift.